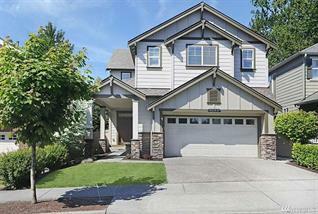 Lake Stevens where you can still find a 5 bedroom affordable home. This home is the picture of perfection. Enjoy the huge, light-filled open concept great room, Chefs kitchen with stainless appl. Main floor offers hardwoods, open rail staircase, highly sought after main floor bedroom/den & 3/4 bathroom. Upstairs find 5 piece master ensuite w/ oversized walk-in closet, 3 additional bedrooms or 2 & a large bonus room. Manicured yard w/ oversized outdoor trellised patio perfect for entertaining.